This information applies to normal and electric Trike Bike’s, it does not apply to Cargo Trikes. We have four delivery options available. Assembled Trike Bikes can’t be shipped outside of the local delivery area because they are simply too big and the couriers won’t take them. 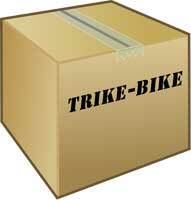 We can only get local delivery for assembled Trike Bike’s using a point-to-point courier. This means they pick up your trike and deliver it direct to you with no other freight on-board. It’s expensive, but it works, so please contact us for a quote. Assembled Trike Bikes can always be collected from our Gold Coast business after your order is received if you have a large van or a tray back ute. A Trike Bike is too large for an SUV vehicle. There is a charge of $100 to assemble, pre-delivery service and test ride each Trike Bike before delivery. The charge to assemble a Cargo Trike is $200. Our 24″ Pedal Trike Bikes are shipped unassembled in 2 cardboard cartons as shown below with full assembly instructions. You can also use these sizes to make sure your Trike Bike will fit in your car. Important shipping statement: Trike Bike parts are securely wrapped in bubble wrap to prevent shipping damage, it is unlikely, but possible that there may be some slight damage or scratches to the parts when they arrive especially to remote locations in outback areas. Whilst we do our absolute best to avoid any damage it sometimes does occur. Please be aware of this fact when ordering your Trike Bike. We will do our absolute best to help you should any damage occur but we are not responsible for loss or shipping damage.